In the past few months, we have been very active as rush started in August. With the hard work of our rush chairs, we recruited 24 freshmen (more than any other fraternity at UNC), many from Texas, Connecticut, North Carolina, Georgia and South Carolina. One hails from London, England. See below. Our recruitment efforts continue to keep our total active membership above 80, which means we are at capacity for our chapter house. In the fall, we held our 8th Annual Eve Carson Memorial 5k. We are pleased to announce that 1600 racers registered and more than $120,000 was raised to benefit the Eve Carson Memorial Scholarship, the Pi Beta Phi Literacy and CEO4Teens (co-founded by Kenny Haisfield ’12 — CLICK HERE to read his article). This past summer, we again won the Paul Beam Philanthropy Award from our National headquarters, which means that we have had the best philanthropy event in the country among all Phi Delta Theta chapters. We have won this award, either first or second in the country, for the last eight years. As one of the best-run chapters in the Phi Delt system, we also won several minor awards. 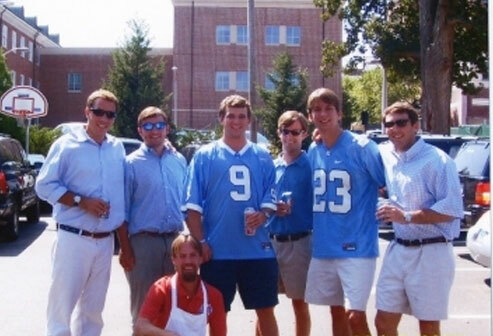 Last spring, we were tied for third in the IFC ratings of 23 UNC fraternities in scholarship. We hope to keep this momentum into next spring. In the fall, we elected new officers. See below. These officers will guide us through the two semesters of 2016. Our 15th Annual Parents Weekend was held during the weekend of the Miami-UNC football game. This tradition started by Steve Bell ’67 is a favorite amongst the chapter members, dates and families. 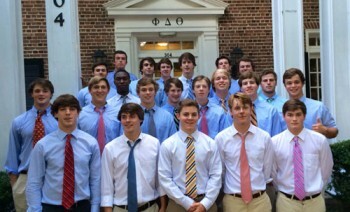 This past year, we have been blessed by having three reunion classes meet at the house for brunch. We encourage other alumni classes to do the same as we are proud of the house. Our cook and house custodian, Tim Galliher, is doing a great job with regard to our food. He has an able assistant in Lourdes Alvarez. In addition, Lourdes’ sister-in-law works on the second and third floors, cleaning the house from 9:00 a.m. to 2 p.m., and we have enjoyed having the house clean on a daily basis. We take this opportunity to thank you for your support of our chapter. In honor of all alumni who continue this support, it is our goal to continue the tradition of the Phi Delta Theta Chapter at UNC for the past 130 years as one of the best fraternities at UNC. Robert S. Cochrane – Charleston, S.C.
Robert Degolian – Atlanta, Ga.
Carter Draughton – Atlanta, Ga.
Jack Fink – Charlotte, N.C.
Alasdain Grassie – London, U.K.
Campbell Hallett – Charlotte, N.C.
Cole Haverty – Atlanta, Ga.
Grant Hedberg – Charlotte, N.C.
Austin Holmes – New Canaan, Conn.
Joseph Howe – Charlotte, N.C.
Ross Jeffries – Charlotte, N.C.
George Lindner – High Point, N.C.
Patrick Littlejohn – Charlotte, N.C.
Matt Lowe – G’Bo, N.C.
Hardin Lucas – Charlotte, N.C.
Ken Selmon – Mabelton, Ga.
Austin Schellpeffer – Charlotte, N.C.
Paddy Sheehan – Charlotte, N.C.
Stephen Smith – High Point, N.C.
Willis Underwood – Goldsboro, N.C.
Edward Wickham – Charlotte, N.C.
Thomas Winslow – Durham, N.C.